Independence Day or the Fourth of July, is a big American holiday. It commemorates the adoption of the Declaration of Independence when America confirmed autonomy from the Kingdom of Great Britain. Is it too late for a post about July Fourth? I don’t think so. Although it’s just one day, traditionally the whole month of July is associated with the holiday. It is an important day in history but it’s also commonly a time for celebration with parades, barbeques, special ceremonies and fireworks. It’s often a family time with reunions and camaraderie between friends and family. It’s a time communities come together. 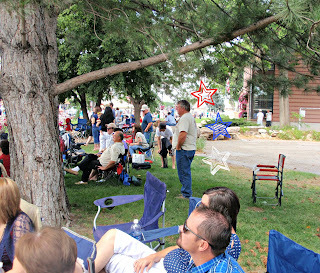 We celebrated the Fourth this year with family and friends. Our youngest son, Ty, lives in Utah so we drove up to be with him, his girlfriend Jennivee, and her family. 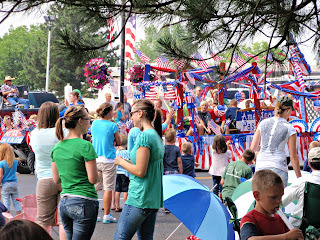 It was a fun time with a parade, a picnic in the park and then a finale of fireworks. The parade was one of the longest we’ve observed in a while. 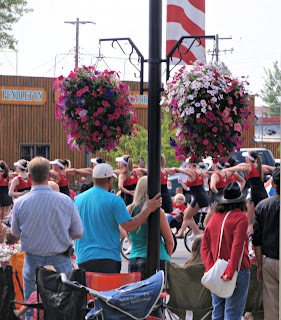 The small town parades we are accustomed to viewing last approximately 30 minutes. That’s if it’s a long parade! 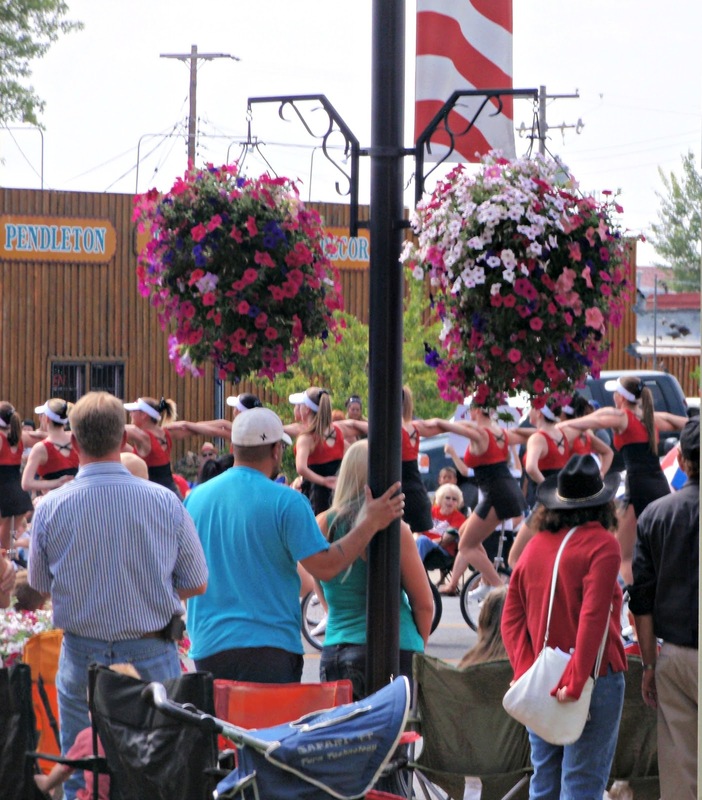 The parade in Utah lasted two hours! 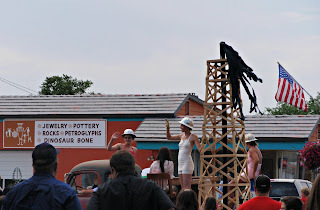 This ‘parade in a parade’ as it was called, had about 50 of the regular type entries but also included a tribute to the oil and energy industry in the Uintah Basin with about 70 entries. It was fun to see the different floats and marchers. They had what we would call a pep squad, with all the girls riding unicycles. Starr marched with her great grandma! The lead float for the oil and energy portion was a replica of a float that made its debut in the 1953 parade with the Uinta Basin Desk & Derrick Club. 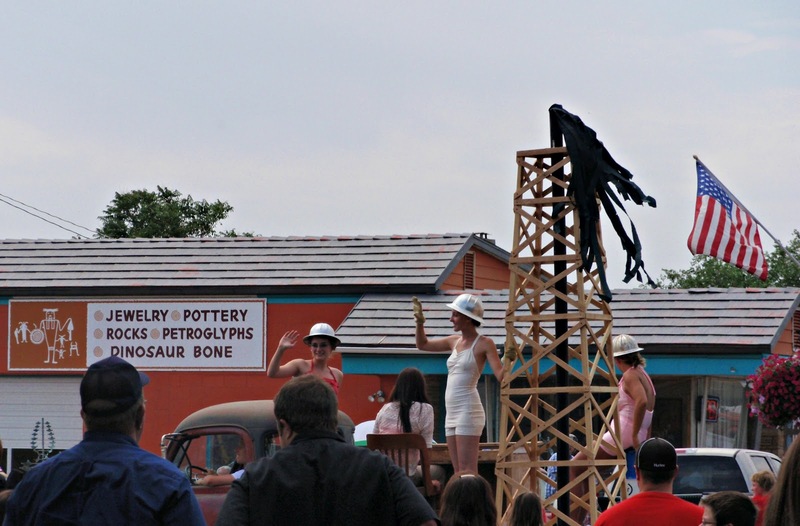 The wooden oil derrick was accompanied by females in hardhats. 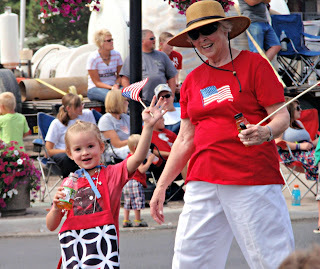 Interestingly, the women on the copy of the float were all grand-daughters to the women who rode on the original float! 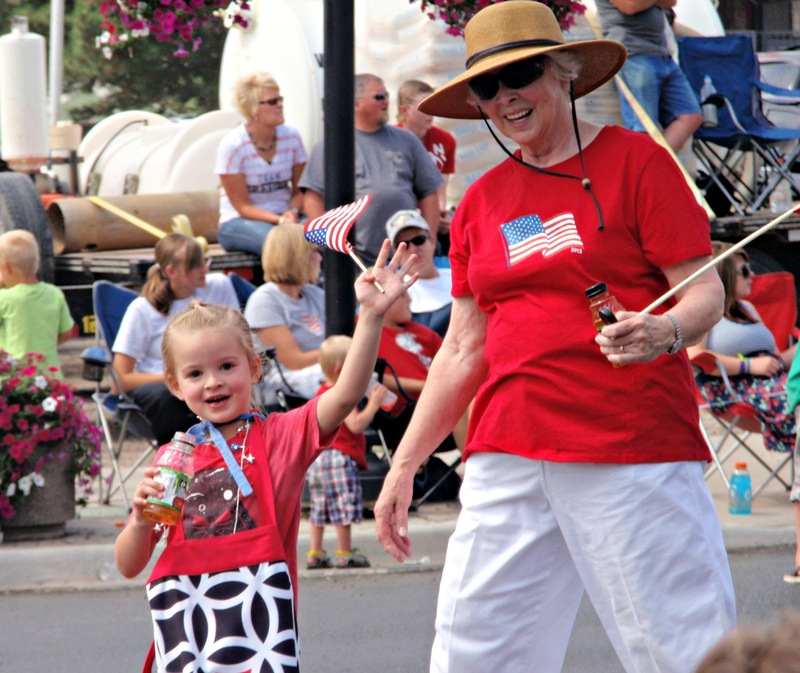 The girls were wearing the swimsuits their grandmother’s had worn when they rode in the parade all those years ago. Three of the women from the original float rode in the parade in a 1953 Ford Sunliner convertible. Granddaughters wearing the swimsuits of the original float riders...their grandmothers! 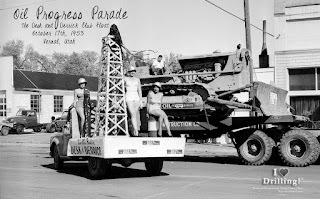 Original float picture from I love Drilling! After resting a bit we headed to the park for the traditional picnic enjoyed by Jenn’s family. Every year they get the same spot, share wonderful dishes, play games and enjoy the company of each other. This year we were graciously included. An uncle rigged up a ‘redneck’ swimming pool for the kids by lining the bed of his pick-up truck with plastic and filling it with water. The kids had a blast! After everyone ate their fill it was time to relax and visit. I was glad to find an aunt working on a cross stitch piece and brought out my knitting without feeling self conscious! At dusk the park started to fill with people claiming a place to observe the fireworks. Unfortunately Utah and Texas share the same dry climate this year and fireworks were restricted to certain areas or banned altogether. Many people brought their own to the designated spot and set them off for all to enjoy. We waited for the city display. When it was finally dark the big fireworks exhibit began. They were beautiful! At the end of the exhibition the crowds started home. It marked the end of a great day, a day celebrating the Independence of America, shared with friends and family. I was happy to knit at the park because I can visit and knit at the same time. I enjoyed conversation with the aunt I was sitting beside and found we had many things in common. I was working on a simple Linen Top from the Kat Coyle blog with the remainder of the Thomas Kvist yarn. I didn’t bring any other so I thought I might as well use what I had with me. I think maybe I’ll have used it all by the time I’m finished! 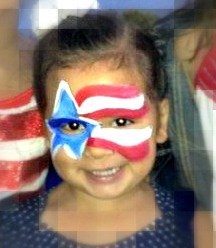 Had to put in a picture of my Belle...patriotic in July! Years ago I made all the kids an afghan. I don’t think it was for Christmas or anything, but just because. 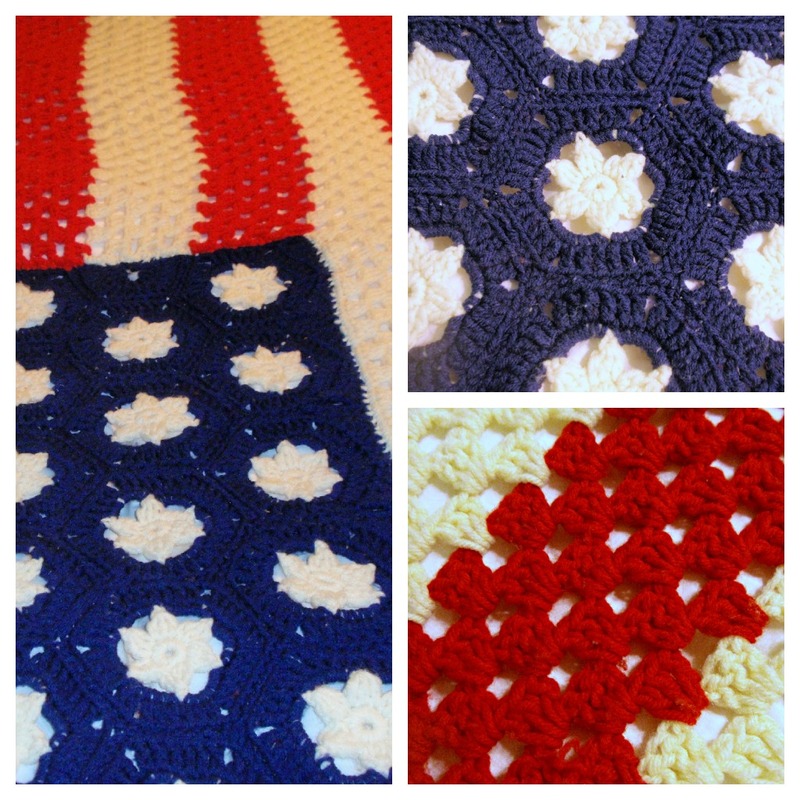 Ironically, as much as I like to knit, all of their afghans are crocheted! Ty wanted me to bring his so I did. It’s supposed to be an American flag and does bear a resemblance! Ty's afghan...from years ago! I need practice in seaming for sure! I remember how hard I worked on it and how great I thought it looked. I see it wasn’t as well made as I thought, but then I’m a bit more critical of my work than most! It’s held up well since it’s at least twelve years old! And it will never wear out because it’s made with Red Heart yarn! The most important thing though, is that he likes it. And I know he’ll use it because it’s cold in Utah! And he’ll think of me when he does! There's a lot of things to be happy about this July. Enjoy and celebrate yours!